shopspaViolet is Serious Skin Care, Serious Fun: Sunscreen all Day, Every Day! Most of us are under the impression we only need to wear sunscreen when at the beach or pool and only if it's sunny outside. Unfortunately 78% of women don't wear sunscreen unless they are at the beach and if they do they believe a SPF of 15 is enough. It is not ! 'It's a necessity to apply sunscreen to exposed daily skin with a SPF 30 or higher and broad-spectrum UVA/UVB protection, even in overcast, wet or cooler climates. I always recommend placing sunscreen next to your toothbrush to incorporate application into your daily routine. The best sunscreen is a mineral-based sunscreen as it reflects the radiation as opposed to chemical sunscreens which absorb the energy into your skin. If you are spending a majority of your time outside, reapplication of sunscreen every two hours is a must to guarantee adequate protection", says Jordana Herschthal, MD. 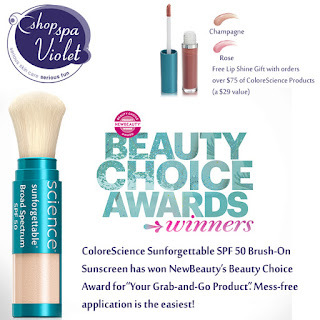 "I love the Colorescience Mineral Brush-On Sunscreen because it is perfect for reapplying sunscreen over makeup, then touching-up other exposed areas, ike my neck and hands. My kids also love this brush. The non-greasy mineral formula makes it easy for us to apply and re-apply sunscreen throughout the day", says Allison Arthur, MD. Did you know damaging rays penetrate regular clothing ? "A regular cotton T-shirt offers an ultraviolet protection factor (UPF) of about 4-6. In contrast, most sun protective clothing has a UPF 30-50. When I kayak or swim, I wear a long-sleeved, mock turtleneck UPF surf shirt and swim leggings. On my days of work, I wear UPF dresses or cardigans to run errands. I also wear broad-brimmed hats and UV protective sunglasses as much as possible to cover the scalp, ears and delicate eye areas. My children wear sun protective clothing daily-they wear t to swim, play at the park or for a long car ride" says Allison Arthur, MD. "sunglasses are not just for style, but also help prevent ocular melanoma", says Jordana Herschthal, MD. Finally! a bona fide reason for hip and stylish shades.